GBPUSD is facing 1.2960 support. 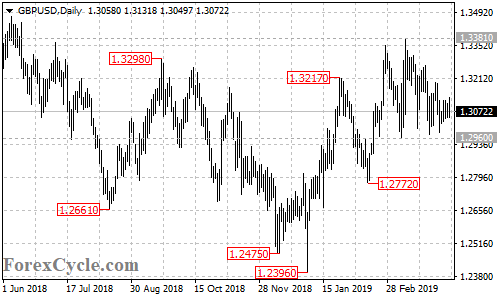 A breakdown below this level would indicate that the upside movement from 1.2396 had completed at 1.3381 already, then further decline to 1.2600 area could be seen. On the upside, as long as 1.2960 support holds, the fall from 1.3381 would possibly be corrective consolidation for the uptrend, one more rise towards 1.3500 is still possible after the consolidation.